Amazing history. Supplied by Triumph Dealer 'Central Garage' Brixham to Mrs Goodsell of Brixham. Central Garages are still family owned and trading. Complete with original 'Passport to Service' PDi'd 29/09/72, Sold and first registered 01/10/72. Invoices, service stamps and completed maintenance schedule checklists for servicing and other works completed for Mrs Goodsell from new up to 09/83 at 60,879 miles - Amazing stuff about 33 fascinating invoices including 'warranty repairs to engine' (Oil pump, crank and big end bearings) at 7,214 miles in July '73! There is little history from '83 to '93, but an MOT in Nov '88 showing 83,269 miles and then July '93 at 84,838. A TSSC valuation in 1993 refers to 'Body extensively restored 3-4 years ago - unused since' There are pictures of comprehensive chassis on repaint (bare metal bonnet) and presumably the colour change from Saffron to green. After a ten year gap, receipts start in '93 for Mr McConnell with a speedo reading of 91,287 in Jan 94 and continue with the same owner to 2002. There is an old V5 showing Mr McConnell purchasing the car in July 1993, with 4 previous owners. I purchased the car last year from the next keeper who had it since 2002, with it last being on the road in 2010. After failing its MOT back then, structural work was carried out by specialist 'Triumph Auto Classique' in Wootton Bassett as follows: New n/s floor panel fitted New o/s floor panel fitted New n/s outer sill panel fitted New n/s centre sill panel fitted New n/s inner sill panel fitted New o/s outer sill panel fitted New o/s centre sill panel fitted New o/s inner sill panel fitted There is no receipt for this, but the work is evident and superb. 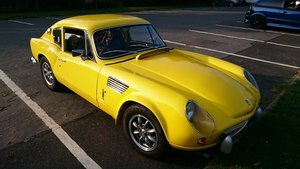 Having had GT6's over almost 30 years and hailing from Devon, when this came up late last year I bought it as a non runner. It still has the dealer window stickers, remains of tax disc holder and dealer plaque on the door. 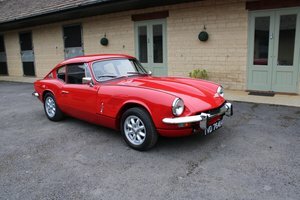 I don't believe it has been off the chassis and has a feel that is so hard to reproduce with substantially rebuilt stuff - The dash for example, is lovely and un-restored - as Triumph intended. I started tinkering and got it running (New battery, plugs) and have driven it on a private road. Changes gear, clutch works. When I bought it, I intended to do what was needed to get it on the road, but it is really to good for that. 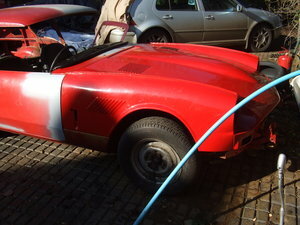 Having become familiar with the car, if I go any further I would want to strip it right down and sympathetically rebuild it, but I don't have the time or facilities so it is store or sell. I Have decided to sell and replace with something I can use until I have more space and time. The work that has been done is to a high standard and the gaps are so much better than all GT6's I have owned, except an ex-concours car. As stated, I think it is so nice with wonderful history and patina that I would strip comprehensively. Make your own mind up but my observations are: Quarter valances - New ones included Bonnet - excellent - Sure there will be repairs when stripped. Tub - sills & floors done beautifully. 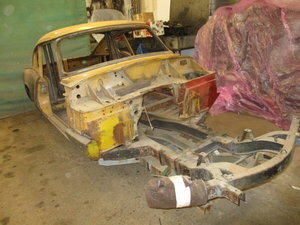 Doors - looks good, a couple of bubbles Roof lip - few bubbles Rear wings - Outer wheel arches cleaned up to view rot. Repair / replace outer arches, outer inner arches & lower inner wings etc. - usual stuff, but boot floor, rear panel and valance should survive. Receipt for Diff at 91,287 miles (01/94) Receipt for Gearbox, rocker shaft and rockers at 102,643 miles (10/98) Some parts were missing from when the metalwork was done, so some trim will be required. Petrol tank was missing. I have a MK2 tank that will go with the car that could be modified by moving the filler neck (I think..) Brakes - need full rebuild Radiator - removed by me (to be replaced / rebuilt) New fibreglass transmission cover fitted Pictures flatter - paint is old New rear radius arms loosely fitted Stainless exhaust New O/D gearknob & switch Original engine Lovely original seats, door cappings, dash, dashtop. Nice sunroof (needs recovering) Can be seen running (from 5 litre petrol can) A UK early low mileage MK3 Rotoflex overdrive car - I love these with the early trim, dials, no headrests, less leyland, more Triumph Hard work done and done well, wonderful history, deserves detailed completion and you won't end up with a 10K car that will never be right, this will be a proper car. There are other invoices for parts, but this is a summary of the receipts for servicing and the MOT history: 24/10/1972	1,000 mile service Central Garage Brixham 1,008	£1.38 15/01/1973	3,000 mile service Central Garage Brixham 3,213	£3.20 10/04/1973	6,000 mile service	Central Garage Brixham £12.36 23/07/1973	Parts and oils used for Warranty engine overhaul	Central Garage Brixham 7,214	£3.22 20/09/1973	9,000 mile service Central Garage Brixham 8,759	£7.12 26/02/1974	12,000 mile service	Central Garage Brixham 11,286	£19.17 24/05/1974	15,000 mile service Central Garage Brixham 13,050	£7.54 12/09/1974	18,000 mile service Central Garage Brixham 13,850	£15.67 09/01/1975	21,000 mile service Central Garage Brixham 15,967	£7.08 29/04/1975	24,000 mile service Central Garage Brixham 17,160	£23.25 23/09/1975	27,000 mile service	Central Garage Brixham 19,554	£11.82 08/01/1976	30,000 mile service Central Garage Brixham 20,815	£25.15 03/05/1976	33,000 mile service Central Garage Brixham 22,619	£12.91 12/08/1976	36,000 mile service + Wheel balance, brake pads & rev counter cable Central Garage Brixham 24,455	£41.06 04/01/1977	39,000 service Central Garage Brixham 26,132	£9.34 16/05/1977	42,000 service + new o/s rear wheel studs and nuts Central Garage Brixham 28,614	£29.15 29/09/1977	MOT + wiper blade Central Garage Brixham 30,002	£14.10 06/02/1978	Service Central Garage Brixham 32,841	£32.15 23/05/1978	Service + silencer & mudflaps Central Garage Brixham 34,416	£51.33 29/09/1978	Service + front trunnion Central Garage Brixham 36,509	£44.17 09/01/1979	Service Central Garage Brixham 38,717	£13.50 19/06/1979	Service and repairs Central Garage Brixham 40,610	£88.02 24/10/1979	Service Central Garage Brixham 42,455	£19.38 21/02/1980	Service and wheel balance Central Garage Brixham 44,567	£43.28 11/08/1980	New front & centre exhaust Central Garage Brixham 46,682	£36.36 21/08/1980	Service & repairs Central Garage Brixham 46,711	£33.73 18/09/1980	MOT & Engine rebuild Central Garage Brixham £165.26 16/04/1981	Service - Note Overdrive not working Central Garage Brixham 49,667	£75.67 29/09/1981	Service Central Garage Brixham 51,598	£19.85 25/03/1982	Service, alternator & repairs Central Garage Brixham 53,852	£81.14 26/04/1982	Body repairs inc. sills, wings and valances Central Garage Brixham £1,035.31 27/09/1982	Service Central Garage Brixham 55,693	£47.28 20/09/1983	MOT	Central Garage Brixham 60,819	£9.00 20/09/1983	Service & heater hose Central Garage Brixham 60,819	£53.31 28/09/1983	Welding to O/S seat belt anchorage & exhaust Central Garage Brixham 60,879	£111.84 22/11/1988	MOT	Central Garage Brixham 83,269	02/07/1993	MOT	Stoke Gabrial Garage	84,838	13/01/1994	Fit customer supplied diff The Regency Garage, Bath 91,287	£242.50 18/03/1994	New N/S rear wheel bearing The Regency Garage, Bath 93,099	£85.89 28/06/1994	MOT	MOT Test centre, Bath 96,231	05/07/1994	Ball joint & trunnions The Regency Garage, Bath 96,218	£172.76 31/01/1996	Shock absorbers, springs and r/h rear trunnion	The Regency Garage, Bath 98,143	£171.43 20/06/1997	Rear brake shoes, shocks, spring & exhaust The Regency Garage, Bath 98,166	£395.77 23/06/1997	MOT	MOT Test centre, Bath 98169	13/08/1997	Front springs & rack mounts	The Regency Garage, Bath 98949	£102.38 07/07/1997	Overdrive switch & valve spring The Regency Garage, Bath £61.96 17/10/1997	Brakes adjusted & bled Woking Garage Slough 99341	£46.97 03/06/1998	Oil change & tracking The Regency Garage, Bath £57.87 26/06/1998	MOT	MOT Test centre, Bath 2310	27/10/1998	New Gearbox, rocker shaft & rockers The Regency Garage, Bath 2643	£747.35 15/06/2000	MOT	FG Bond & Son, Chippenham 2669	29/06/2000	Welding to n/s floor, tie bar & seat belt mounting area F.G. Bond & Sons £178.98 25/05/2001	MOT	Oval of Bath 2700	Adjust rear brakes, fuel pump & temp sensor The Regency Garage, Bath 2713	£196.01 06/06/2002	MOT	Oval of Bath 2745	06/06/2002	MOT, free clutch, service, Coil, Dist. Cap, rotor arm & fuel pipe to carbs The Regency Garage, Bath 2745	£245.93 31/07/2002	Service & tappets Dursley Garages 2961	£153.53 20/05/2003	MOT, Service & tappets Dursley Garages 4033	£199.19 04/06/2004	MOT, service , fuel pump, master cylinder	Dursley Garages 5993	£217.84 25/06/2005	MOT Dursley Garages 6552	£42.10 26/06/2006	MOT DVLA search	7221	12/10/2007	MOT DVLA search	7910	Photos are: Photo 1: Car now Photo 2: Some of the photos from when it was stripped and painted - est 1990? Photo 3: Car now - example of work done after a quick clean up with a wire brush Photo 4: Car now - Outer sills fitted Photo 5: Car now - Some of the trim loose fitted and after a quick clean Photo 6: Some of the incredible history. For most of the work at Central Garage for each visit there is a completed service schedule form, service stamp and detailed invoice.